Spa is very close to the Netherlands, so it’s easy to visit for me. It’s an iconic venue with breathtaking landscapes, and a lot of F1 history. Every Formula 1 fan feels at home here. I already went to Monaco this year, and I’d booked to go to Monza as well, so I only went to the Belgian GP on Friday. The best way to come to Spa is by car because there isn’t a good public transport network which connects the circuit with the closest cities. We set off early to beat the traffic, leaving my home in the Netherlands at 3:45am and arriving around 7:30am. Should you visit Spa in the future remember to get there early, or better still, stay at one of the trackside campsites which offer you a great atmosphere. Don’t be in a hurry to leave after the race on Sunday. A delay of 3-4 hours due to traffic jams is quite normal at Spa right after the race. After arriving at the circuit, we went to the Fan Zone for a coffee. I was impressed by the extensive entertainment options on offer! The new owners of F1 have made real progress, introducing a big stage and different interactive areas to improve the fan experience, such as a Pitstop Challenge and the Gamezone. After watching the first F1 practice session from Gold 4, we had lunch and relaxed at the lounge-area in front of the stage, where a DJ entertained the crowd. We watched the second F1 practice session from the Bronze zone near Les Combes and Rivage. It started raining in the last part of the session, but we stuck it out for Formula 2 qualifying. The long drive home wasn’t so bad, as we were already starting to get excited for our trip to Monza in a week! Where to watch the action at Spa? It was a low budget trip, so I bought Bronze tickets (General Admission). 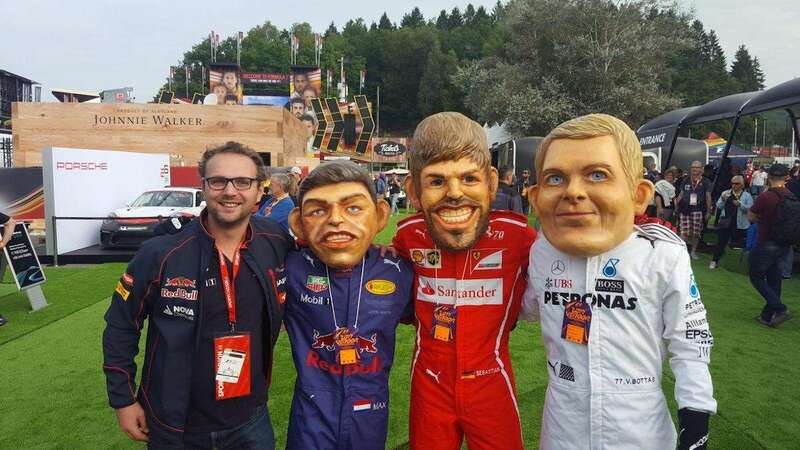 Lucky for me, my friend couldn’t make it and gave me his ticket for the Gold 4 grandstand, which is near Eau Rouge. We also explored the Bronze areas, which are huge and have spectacular views. I recommed visiting Kemmel Straight (a popular overtaking spot in the race), Pouhon (an awesome high-speed corner) and Rivage. This last corner is my favorite spot because you can get very close to the cars. What tickets to buy for the Belgian GP? Bronze (General Admission) tickets offer you great value for money with excellent views around the track. The only downside is that they can get very busy, especially on Sunday when you have to arrive really early to get a good spot. Grandstands at Spa are pretty expensive. I recommend the cheaper Silver 2, which has great views of Eau Rouge. Monza is the “temple of speed” and the home of Ferrari. It’s a classic circuit that every diehard F1 fan needs to visit at least once! Many highs and lows from F1’s rich history happened here: fatal crashes, the return of Niki Lauda after his crash at the Nordschleife (1976) and historic wins (Berger in 1988, Schumacher in 1996, Vettel in 2008). We booked a flight departing Amsterdam at 7am on Saturday morning headed for Linato airport with Alitalia. Unfortunately, it was cancelled a few minutes before we were due to board! Fortunately, we were able to book a new flight with Lufthansa and landed in Milan at 1pm, only 4 hours late.. After picking up our rental car we drove to the blue parking zone next to the circuit, where a shuttle bus brought us to Parco di Monza. I must admit this was surprisingly well organized by the Italians; much better then in Belgium! Monza is unique in many ways: the Tifosi, the Italian chaos in the paddock area, the history with the old banked circuit and the podium ceremony makes Monza a great place to visit. Because of our flight cancellation we arrived too late for FP3 and should have also missed qualifying. Fortunately for us, qualifying was delayed till 4:40pm due to bad weather. I think we were the only fans happy with this delay! The cars had to qualify on a wet track and the session was a real thriller. As we are from Holland we were hoping Max Verstappen would get his first pole position, but in the end it was Lewis Hamilton that took a record 69th career pole, breaking Michael Schumacher’s record. After qualifying we went to our hotel in Melzo, a small industrial city 20 minutes drive from Monza. On race day, the weather was much better, 26°C and sunny. We missed the Formula 2 race in the morning because of the long queue for the security checks, but we were just in time for the Porsche Supercup race, the drivers parade and of course the Italian Formula 1 Grand Prix! There was a record crowd at the circuit and almost all the grandstands were fully packed, so the atmosphere was awesome. After the race we walked along the old banked circuit before heading to the airport, where I met Carlos Sainz, Johnny Herbert (Monza winner in 1995), and Esteban Ocon. A great end to a fantastic weekend! Two years ago I visited “Free Friday” at Monza, where you can sit in pretty much any grandstand you want. I find it awesome to be able to walk along the track during F1 sessions and watch the action from as many corners as possible! My favorites were Grandstand 12 (Variant Ascari), which is very close to the track, and Grandstand 23 (Pit Entry), where you can see the cars braking hard to enter the pits. Grandstand 23 is also very close to the General Admission area inside the Parabolica corner. I would also like to mention Grandstand 6c. This one is situated a little further from the track but offers a fantastic view of the first chicane. For fans with a lower budget: the general admissions tickets are also very good value for money. The GA areas near the Lesmo and Parabolica corners are the best. This year, we bought tickets for Grandstand 23A near the pit entry. Both tracks are fantastic to visit but my personal favorite is Monza, mainly because the ticket prices are lower and it’s easier to get to the circuit. What do you think? Leave a comment below! Click here to read our travel guide to the Italian Grand Prix at Monza.